Though a leading institution at the time, little is known of Tycho's movements while at the University of Wittenberg other than that his stay there was very short. Due to an outbreak of the plauge, he was naturally inclined to leave the city, doing so in September of that same year, having spent only five months at the university. He arrived in the city of Rostock during the second week of September and was admitted to the university on the 24th of that month. Yet, Tycho's choice was surely a matter of where to go in a hurry then a carefully thought out decision, as the university did not have an academic program in astronomy. Whatever the case may have been, the end of 1566 saw the occurrence of two events that give us some insight into the lesser known aspects of his talents and character. 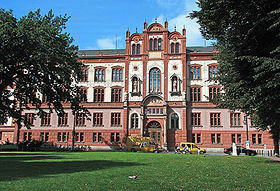 Shown at right is the University of Rostock's central building and entrance courtesy Wikipedia. If anything can be said regarding the incident in which Tycho lost part of his nose, it is that the duel in which it happened has become almost as well known as is his extremely accurate records of naked-eye star observations and perhaps as popular and notable as his pet Moose, which drank beer and a court jester and dwarf named Jepp that Tycho believed was a clairvoyant. The story is interesting in that the incident lasted only a minute or so at most, while the results of the duel left Tycho with a life long disfigurement that required the use of a metal alloy prosthesis that could not, considering the location of the wound, be hidden. At left is a portrait of Tycho Brahe, clearly showing his damaged nose. Additional portraits of Tycho can be found at the MacTutor History of Mathematics website at the University of St. Andrews in Scotland. What is probably the most historically relevant outcome of this incident is that neither man seemed to begrude the other in any way. The hostility between the two ended with the duel and Parsberg eventually became one of Tycho's supporters under the Danish King Christian IV. Between the end of 1566 and the beginning of 1572 Tycho moved about the European countryside quite a bit and while we do know that he recorded his observations, a good deal of his history at this time is more the result of where he eventually showed up. What follows is a precis from J. L. E Dreyer's techinical biography on Tycho. In April of 1567 Tycho observed an eclipse of the sun which was "seven digits" at Rostock. Thereafter, in the summer of that year, Tycho returned home but doesn't seem to have received a very warm welcome and therefore was back at Rostock at the end of that year. It was during this period that Tycho also made the acquaintance of a few of the more notable and forward thinkers of his day. 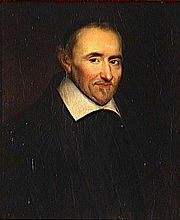 This included men like the educational reformer Pierre de la Ramée, astronomer Cyprianuis Leovitius, German historian and humanist Hieronymus Wolf, Philip Apianus, son of the famous Pete Apianus and author of Astronomicum Cæsareum and the German astronomer and the mayor of Augsburg Paul Hainzel and his brother Johannes Baptista Hainzel. Shown at right is an image of Pierre de la Ramée (Petrus Ramus) courtsey Wikipedia. Tycho eventually settled at Augsburg, the city most dear to Protestants at that time due to its position as center stage for that era's reform movement under the 1555 Peace of Augsburg settlement. It was here that Tycho constructed his first of many observing instrument; it was his opinion that those at hand were just too simple for accurate scientific purposes. In collaboration with Paul Hainzel, they built a large azimuthal quadrant (used to measure the heigth of stars) of about 19 feet, erecting the device on the top of a hill on Hainzel's estate in Göggingen, where, in 1572, it was used to measure the new star (supernova SN 1572) and a handful of fixed stars. The quadrant remained at Hainzel's estate until it was destroyed by a storm in December of 1574. On November 11, 1572 Tycho was returning to his home when, looking up towards the constellation of Cassiopeia, he noticed a star where none had been before. Since he had just completed construction of a new sextant instrument, which had a much higher degree of accuracy than earlier cross-staff devices, he was able to measure the distance of the new object with the device using the known stars within Cassiopea. 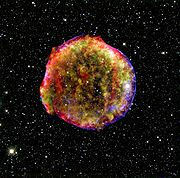 For Tycho, the appearence of the new star was most portentous and for the rest of his life no other single event would be more influential in shaping his path and career. 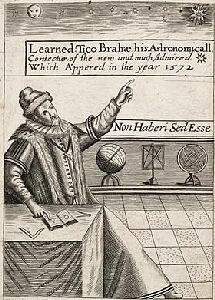 De Stella Nova was initially printed in small quanities and saw little distribution (though it was well received by those to whom it mattered, gaining Tycho a measure of fame and patronage) until it was reprinted in at least two further works, a 1632 English printed translation titled Learned Tico Brahae his Astronomicall coniectur in which were added two additional images (one of which is shown above) and a facsimile, Operum primitias De nova stella (Copenhagen), which was printed in 1901 as a tercentenary tribute to the authors memory; the book De Stellar Nova is also responsible for having coined the term "nova". Tycho's work was about to begin in earnest and its results would produce one of the most lasting legacies in the science of astronomy. It arrived in the form of meticulously recorded observations made from the island of Hven, revealed by the hand of another who's work would have an even larger influence upon 17th and 18th century science. All this would be accomplished using some of the most highly devloped instruments that European astronomy would see till the advent of the telescope in 1607. 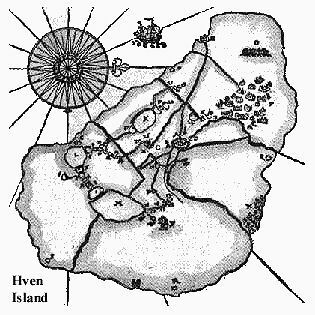 Shown at left is a drawing of the Island of Hven, courtesy Visualizing Tycho Brahe's Mars Data website. Before venturing to the Island of Hven and the meeting between Tycho Brahe and Johannes Kepler, let us now look to the life of our next great thinkerGalileo Bonaiuti de' Galilei. 1. Dreyer also questions Tycho's decision to enroll at this particular university, Tycho Brahe, pp. 24-26, but with good cause, reasons that the study of astrology, mathematics, alchemy and medicine were close enough to what Tycho required in pursuit of his goals to make going there worthwhile. 2. It is often mentioned that Tycho's nose was made of silver and gold and given his status and means, most appropriate, (see  below, Dreyer's Tycho Brahe, pp. 26-27). However, it is noted by some, such as Cecil Adams  and Fredric Ihren  that the false nose also had copper. Ihren wrote that when Tycho's tomb was opened in 24 June 1901 green marks were found on his skull, suggesting copper. Cecil Adams also mentions this green colouring which was noted by the medical experts who examined the remains. Since copper is much lighter than gold and a tad less than silver one can only image the weight of a nose made solely of gold or silver. 3. Digit in this sense; used in expressing the amount of overlap of the Sun and the Moon in an eclipse. The "digit", as used herein, is equal to half the length of the apparent diameter, given that the two objects being virtually the same apparent size from Earth; i.e. 10.5 digits would equal 5/6ths of the sun. Webster's Revised Unabridged Dictionary (1913): (n) One twelfth part of the diameter of the sun or moon; a term used to express the quantity of an eclipse; as, an eclipse of eight digits is one which hides two thirds of the diameter of the disk. 4. The full latin title of De stella nova is: De nova et nullius aevi memoria prius visa stella or "On the New and Never Previously Seen Star". Translation courtesy The Galileo Project website. Ihren, Fredric Tycho Brahe's Nose And The Story Of His Pet Moose, containing a translation from the work of Gassendi. 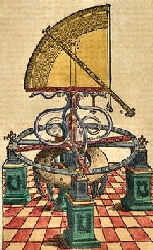 This webpage is maintained by Fredric Ihren as a part of Tycho Brahes Glada Vänner, a Tycho Brahe society. Smoot, Professor Professor Smoot's Class Physics 10, Lecture 3 Describing Motion: Tycho Brahe (1546-1601). From the "The Smoot Group" website which conducts exciting research in the area of cosmology and astrophysics that typically has a link to fundamental physical principles. Ihren, Fredric Links to other Tycho Brahe Resources A nice listing of links to other Tycho Brahe sites around the internet. Thoren, Victor E., The Lord of Uraniborg: a Biography of Tycho Brahe (New York: Cambridge University Press, 1990). Reviewed by Gabriel Fain (Hist 5040 - Summer 99). Tycho Brahe: Biography from Answers.com. This is a compilation of reference sources from who2 Biography, Britannica Concise Encyclopedia, Columbia Encyclopedia, Occultism & Parapsychology Encyclopedia etc.